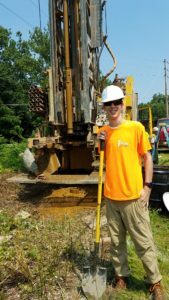 2018 Intern, Jack Yekel, stands with a drill rig at a site in Boyertown, PA.
Liberty Environmental, Inc. is seeking a qualified candidate for an internship position for the summer of 2019 based in our Reading, Pennsylvania office. The candidate will gain hands-on, real project, field and office experience working with Liberty’s environmental scientists and managers on sites throughout our service area in Pennsylvania, New Jersey, and New York. Candidates should be enrolled as a Junior or Senior class student in a Bachelor’s degree program in environmental science, engineering, geology/geosciences, or related field. Master’s degree students are also encouraged to apply. In addition, candidates must possess strong communication, writing, computer skills, and a valid driver’s license. Interested? Please submit your resume to hr@libertyenviro.com by March 1, 2019.